A chance encounter last night took us past the new Hidden Sands Brewing location that is within a few minutes of home. We had friends and fellow Brew Bloggers with us while taking a different exit back to our place. Luckily they were open, it is still their grand opening this week and earlier today they received necessary approvals to distribute at a higher volume. This comes with a requirement that we take a guided tour…pretty cool tour, dumb requirement so, I’m torn on that one. The whole brewery is automated and the place is gleaming and new. There is an area where you hope to be invited to a party in the near future that sits above the brewing production area. The tasting room below has a nice size bar and smells nice and new. The facility is really really nice and feels nice too, if that makes sense. 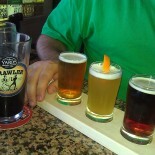 The First Drop Baltic Porter was my favorite and the blueberries floating in the flavorful Sandy Blue impressed LongBrew. However, I think I need to go back and give them another try. My neck was bothering me and I think that may have overshadowed my enjoyment or something because I didnt enjoy their ipa. And from their description, I should have loved their ipa. I was told by friends that the double ipa was something very nice, but I didnt try that one and I was bumming I didnt like more of what I was tasting in my flight. There were a good number of choices for having just opened, but I was driving and couldn’t try them all. This place will be a force to be reckoned with soon, but for now I’m sticking with the Porter over the ipa. I also like the cranberry white variety, as the fruit was very subtle and I usually don’t want fruit in my beer. Otherwise, I need to go back soon and try it again. This entry was posted on January 19, 2018 by DuffBrew in Uncategorized.